I have a very rare Ronald Reagan print collage that sums up all his years with GE,sag,hesterfield and govenor of california. 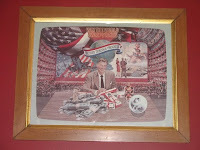 It is in original frame(set to look like tv screen.Backdrop is a opera,war films history and the red scare that took holywood in the 60's. The print also shows the republican symbol for when he left the democrat party and jelly beans he used to quit smoking. If you are familiar with this item and can help Stan with an idea of value, or if you would like to make an offer to Stan to purchase this item, please click on the comment button. I've had this button for over25 yrs or more. I found it in a House that was built in early 1800s it use to be "THE HOUSE" in Charlestown West Virginia. Harpers Ferry was 10 miles away. If you can provide information for Kenneth please click on the comment button.